Air Source Heat Pumps and the Renewable Heat Incentive. The Energy Saving Trust heat pump survey in 2009 found that many users were not impressed at all. The follow up in 2013 improved the results but the final average system COPs of 2.45 (air source) and 2.82 (ground source) were still way below the headline figures quoted for these machines which are going over 4 these days. What is really good about heat pumps is that they can deliver more energy than they consume in electricity. 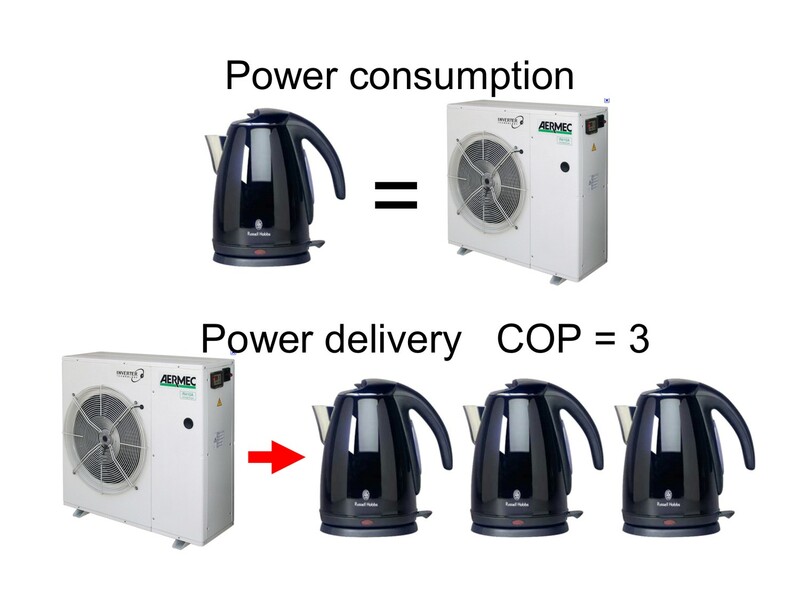 So a small one would be just like this diagram; working on the power of an electric kettle but delivering the power of 3 to your hot tank – a COP (Coefficient Of Performance) of 3 then. By contrast your immersion heater delivers and also consumes the power of an electric kettle so it has a COP of 1. Heat pumps are all sold with an industry standardised COP. This is misleading to say the least and the reason why optimism is defeated by experience. 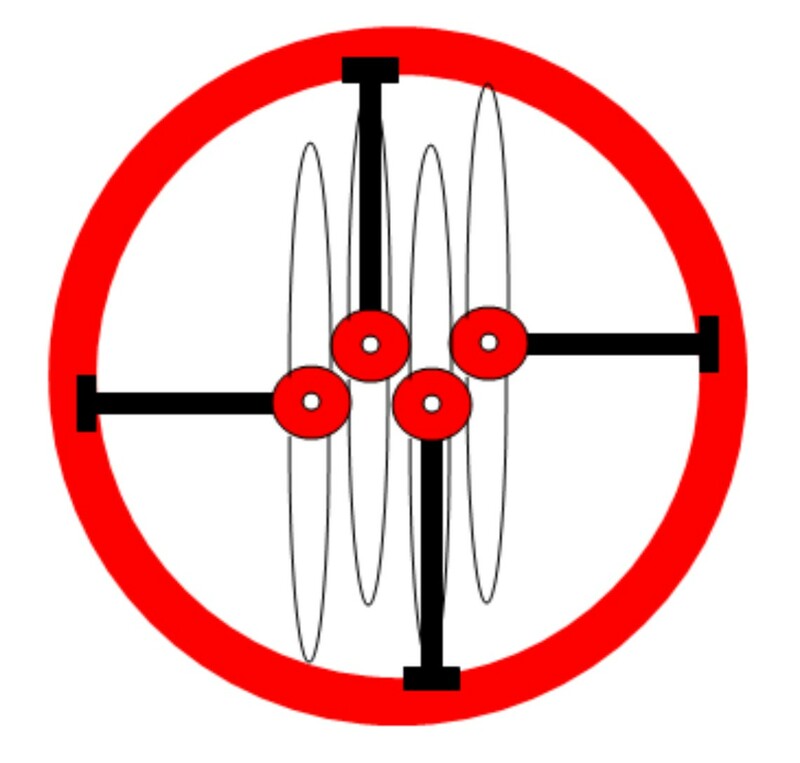 Far from being a fixed figure the COP actually swings widely depending on outside air temperature and temperature delivered in the home. The COP plots here show how a kick is engineered to give a good headline figure; that kink in the graph is exactly at the publication point. You might buy a machine with a quoted COP of say 3.75 but while making domestic hot water on a cold night it will be working at less than 2. There are benign swings however and given a sunny winter day with some warm air to chew on an ASHP can see COPs almost up to 5. Gas per kW.hr costs almost exactly a third of electrical power so after adjusting for efficiency a gas boiler is similar to a heat pump with a COP of 3. Many people in the survey would be comparing their new heat pump to a gas boiler; a formidable opponent when running on cheap gas. A gas boiler is much more powerful than most heat pumps and delivers at usefully high temperatures so a heat pump must have an overall COP of over 3 to justify a hefty purchase price and compare favourably. To be fair the Renewable Heat Incentives state that heat pumps are suited to people without access to town gas. So for them heat pumps are suitable but perhaps the performance could be lifted further? To winkle out some ideas we’ll take daily temperature data for January in Guildford (http://www.wunderground.com/) and relate that to a COP matrix made from the published data from a modern ASHP (inverter drive scroll, r410a, delivering to under floor heating at 35 degrees). We will be looking to lift the COP by running the ASHP at the warmest ambient temperatures possible. There is usually a 5 degree swing between the mean night time temperatures and the daytime mean. Night time temperatures are flatter and longer than the sharper daytime peak at 1-2pm. The morning transition from lows to highs is halfway there by 10am. Temperature rises coincide with sunrise, not surprisingly. Running a 7hr shift from 10am gives an average COP of 3.86 – much better than gas. The equivalent night time shift only gives a COP of 2.92 – but almost as good as gas. If the pump has to make hotter water for radiators these day/night figures drop to 2.7 and 2.11 and for 55 degree hot water making 2.3 and 1.85– gas beats this hands down. Storing daytime running means that delivery temperatures probably need to be around 50 degrees leading to an average COP of under 3 although bigger storage tanks improve this. ASHPs can be smaller if they run continuously day and night on an average COP of 3.4 – still 13% better than gas. 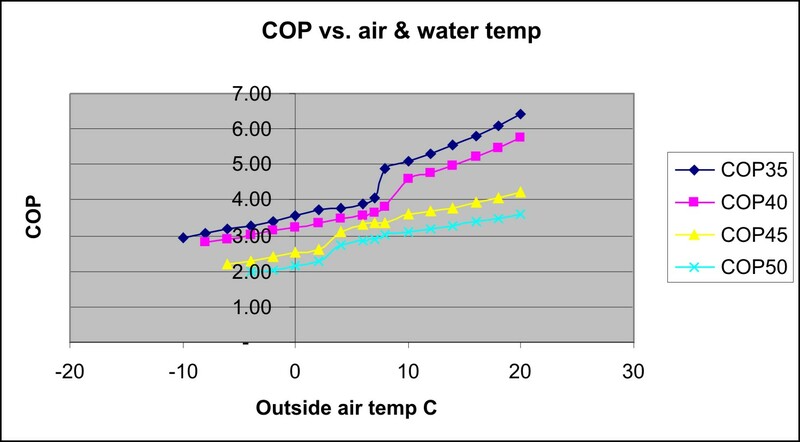 Direct electrical heating is often used to boost hot water making (COP = 1) and this can lower the average COP. If we can avoid this practice and run predominantly in the daytime it should theoretically be possible to get a COP of 3.35 (7hrs day, 2hrs night, 2hrs hot water). Transmission: Put 100W/square metre through your floors and your feet will be uncomfortably hot so somewhere near half that will be a good yardstick for calculating the power you need to heat the floors then leave some surplus to top up a tank. A small ASHP can run considerably more efficiently than a gas boiler in a modest well insulated house. Fan-coil units in bedrooms and underfloor heating elsewhere are essential. The heat pump should run in daylight except maybe for a boost before dawn to guarantee morning showers and take the chill off the floors. I should just mention one little thing in favour of the heat pump; the RHI incentive of 7.3p/kW.hr pitched to pay for the heat pump itself after 7 years. You’ll need to spend another £4,000 on proper tanks to integrate any other sources such as a wood burning stove and a combination like that would be a joy for anyone living out in the middle of the country. Of course if you make your own electricity, or you want to be green, then a heat pump is already the answer.